This is probably the last rhubarb of the season. But this is the first time I’ve ever made pie. 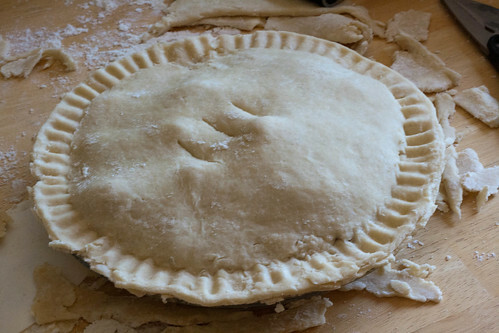 I’ve made pie crust before, though not exactly successfully. 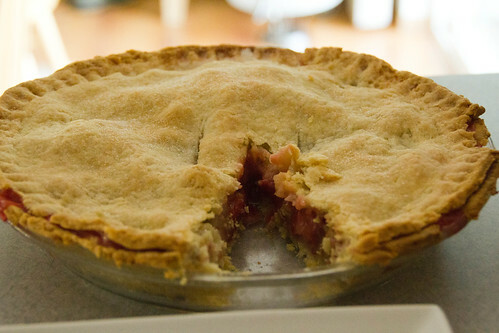 I Googled for about a week, trying to learn all the secrets of pie crusts. How does one make them flakey? What about perfectly golden brown? How does one get the crust in the pie plate without ending up in a ball of tears under the kitchen table? You know, standard Google questions. The consensus was that Martha’s got it goin’ on. For real. I have to say, it was pretty scary making the pie crust, but it worked! And if I can do it, you can too. 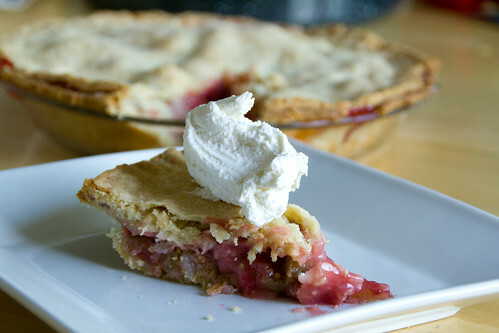 Pie crust from Martha Stewart and a hundred other food blogs–thanks everyone!! 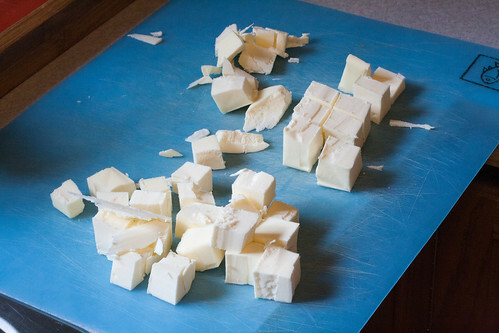 Cut butter into small cubes and freeze for 15 minutes. Combine flour and salt in a bowl, then add the very cold butter and combine with a pastry cutter until it looks like coarse sand. Sprinkle ice water over the mixture and press the dough together with a rubber spatula. Eventually you will be able to pinch the dough together and have it stick to itself. Preheat oven to 375F. 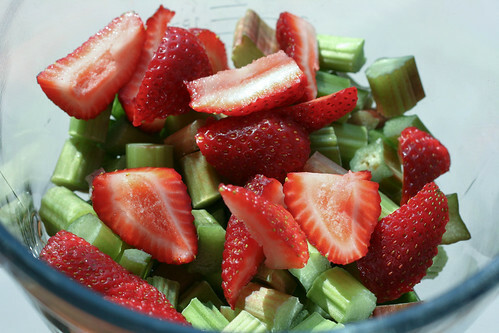 Whisk the sugar and flour together in a bowl, then toss the rhubarb and strawberries into the mixture until everything’s coated. Generously flour a surface and rolling pin. 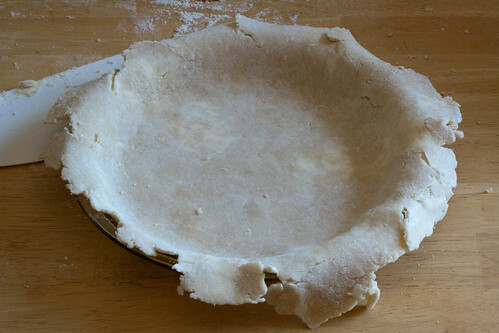 Roll one pie crust out to about 1/4 inch thickness (not too thick, not too thin). 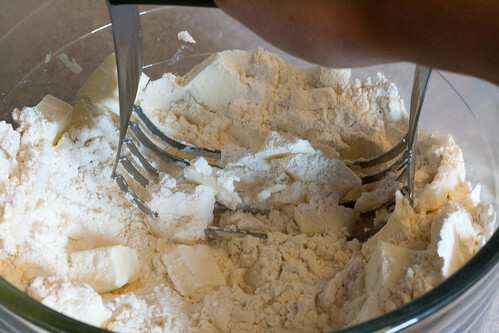 Here’s the hardest part: if the dough splits or cracks, don’t panic! Just wet your fingers with ice water and pinch the cracks together. If it seriously gets too frustrating, scrap it and refrigerate it covered in plastic wrap again for about 20 minutes. Carefully transfer the rolled out dough to a pie plate. 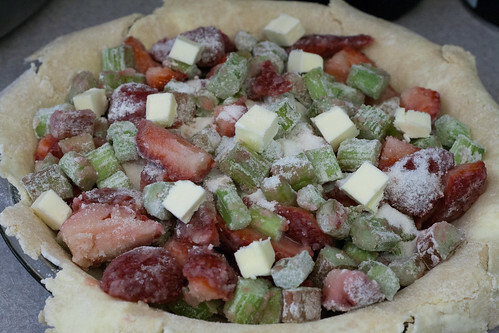 Pour the strawberry rhubarb mixture into the crust (you don’t have to pour the excess sugar/flour into the pie. I didn’t and it was perfectly sweet). 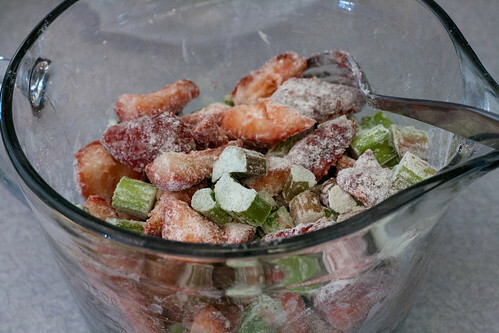 Cut the remaining tbsp of butter into small cubes and dot the pie filling with it. 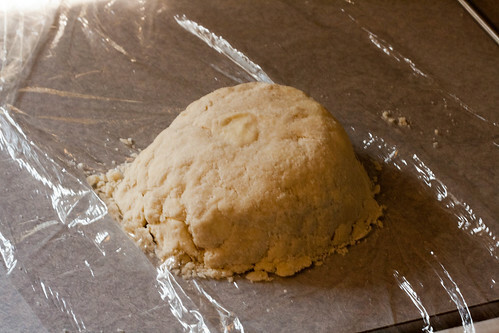 Roll out the remaining pie crust, and transfer it onto the pie. Slit the top crust to vent, and pinch the edges together. Bake in the oven for about 45 minutes to an hour, watching so that the edges don’t burn. If the edges start getting too brown, just loosely cover them with aluminum foil. These are probably the last strawberries of the season. I can’t think of a better use for them. I also sprinkled sugar over the top crust right before it went into the oven. Holy yum! Homemade whipped cream or vanilla ice cream isn’t necessary, but why wouldn’t you?